Dallas - Spicy East Texas ranch house taste. Made for Beef but good on Chicken too! Perfect balance of sweetness to salt to bring out the wonderful richness of salmon, with an extra smoky finish to give you the great smoked salmon experience without a smoker. In the northwest territory of the US, Salmon is king. When salmon season swings in it is on everyone’s BBQ or in everyone’s oven. What is not to love about a perfectly seasoned and cooked salmon? Soft, yet fleshy, rich with sweet (and healthy) fat that just makes your mouth water. Every BBQ competitor and every BBQ restaurant start with a rub. The foundation of all great BBQ or grilling begins with your rub. The basic spices of the rub will enhance the flavor of whatever you are cooking, and also modify the flavor of the sauce. This gives you the effect of a different sauce for each rub you use. Try one of our fantastic Burnt Sacrifice competition-class sauces, available in several spice levels, to finish with our rubs or use as a dipping sauce. 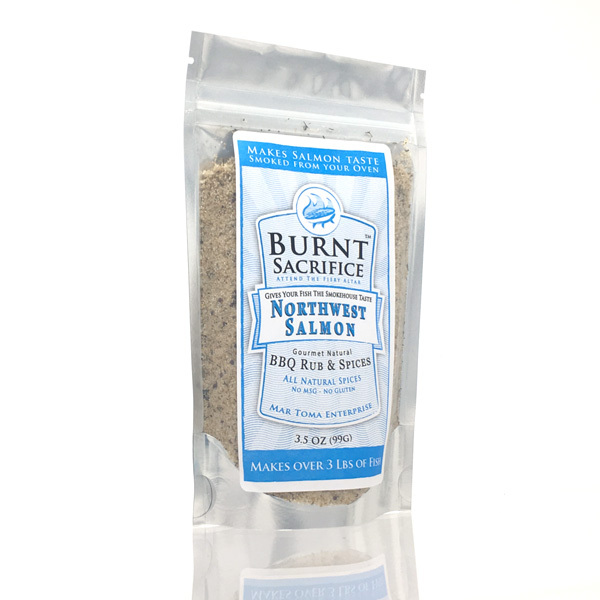 Our rubs are specifically designed to be bold enough to stand up on their own so you can enjoy the flavor of the meat, but will also work well to enhance the BBQ sauce. To prepare, liberally apply the mix on your salmon on the flesh side (or both sides if skinless) and put in the refrigerator for a few hours or overnight and you will actually see the flesh begin to cure.